Is there any reason why tickets for the Tulane game are showing at 2 pm and not 1 pm? I'd be interested too in the raffle! I noticed that too on Spectrum. Looks like I see three potential channels on Spectrum: 809, 820, and 821. BTN and then BTN Extra 1 and 2... hopefully one of these have it! Your best bet for a direct flight would be to Atlanta. Best direct options are: Southwest, American Airlines, or Delta. My parents are looking to get as close to the stadium on Saturday as possible given the possibility of rain. Send me a message if any are available for sale. Thank you! Has anyone else NOT received an e-mail or notification of any sort yet? Thought this warranted its own thread. Flight options as of December 4th: Flight options direct from Tampa: Southwest, limited and pricey leaving Wednesday and coming back Friday. If you're flexible on dates and want to extend your trip: leave Tuesday and come back Saturday. This is a bit long for my taste: Flight options direct from Orlando: Southwest, a couple options with good prices leaving Wednesday and coming back Friday. What are the expectations for a bus from Tampa? How much would this likely cost? The regular season ends when DJ says it ends! I have two tickets available for the homecoming game against ECU on Saturday, October 8th. 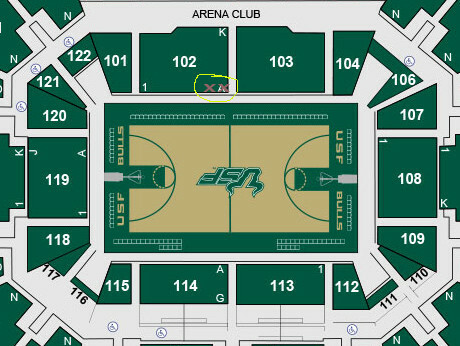 Tickets are on the home side, section 215 in row W. It's right underneath the overhang. For the FSU game we were about 2/3rds the way through the first quarter and then had shade for the remainder of the game. Asking for $20/ticket. Thank you! ACC Network "Blacked Out in Your Area"
What's with FSU ticket sales? I believe one can still buy three game packages. A great way to bring down your price per game. Hopefully this will boost attendance for other games as well. Mine "initializes" but then no sound or video. Guess I'll just have to keep working Keep those of us who can't view it updated please! Still blank or are you seeing live footage?